In both cases, Thai police are waiting to talk to the husbands of the Thai women before deciding on further legal action. Both men are expected to recover after hospital stays. Two Thai woman with foreign partners were involved in seperate serious incidents of violence today in rows that were hours apart but which saw their respective husbands hospitalised. It comes as Thailand’s Songkran festivities began to wind down. It is well know that the Songkran festival season can test any relationships in Thailand as it is a time for celebration and for family reunions that inevitably expose often overlooked tensions or personal differences between individuals. Two violent incidents involving Thai wives with foreign husbands just hours apart on the same day and all linked to tensions brought on by Songkran celebrations. In the the first incident, a 28 year old UK foreign husband made the cardinal mistake of insulting his Thai wife’s parents while in the second, a man from Myanmar is reported to have self mutilated himself when a row with his Thai wife in Trat province got out of hand after he returned from a Songkran drinking session with friends. A UK man had to be rushed to hospital early on Tuesday morning after his Thai wife attacked him viciously with a knife. 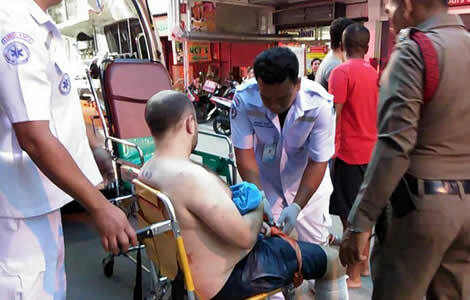 Rescue crews were called to an apartment in South Pattaya in Chonburi province at 6.30 am to attend to UK national, Benjamin Laister Crowson who is 28 years old. The UK man suffered cuts, lacerations and puncture wounds to his legs and left arm. They were inflicted by his Thai wife named as 23 year old, Monthita Buatong. The medical responders at the scene performed first aid treatment on the UK man before later having him removed to a local hospital. It is understood that Thai police have arrested the Thai woman but are also seeking to interview Mr Crowson in order to determine exactly what happened. The UK man’s Thai wife admitted to police that she attacked her husband with the knife. The couple had been on a night out and when they returned to their apartment, her husband spoke about the Thai woman’s parents in a very derogatory manner. She told the Thai police that had her husband had inflamed her anger in the midst of an already heated quarrel by speaking badly about her parents. Later on he same morning, another Thai woman was embroiled in a violent incident involving her foreign husband, this time a man from Myanmar. The woman from Tak province in the west of Thailand bordering Myanmar, claims that her Burmese husband took a scissors and caused serious injury to himself by puncturing his throat after a flare up of emotions between them. Thai police were called to rented house that the couple shared in Tambon Mae Pa at 9 am in the morning. The Burmese man was found suffering from a severe laceration and trauma to his throat while a bloody scissor lay adjacent to him. His 55 year old Thai wife, named as Makhin Ae, explained to police that her husband had returned from a drinking session with friends earlier. The couple had gotten into a heated argument before the Burmese man self mutilated himself with the scissors. Thai police are believed to be interested in interviewing the woman’s husband who is reported to be recovering in hospital.